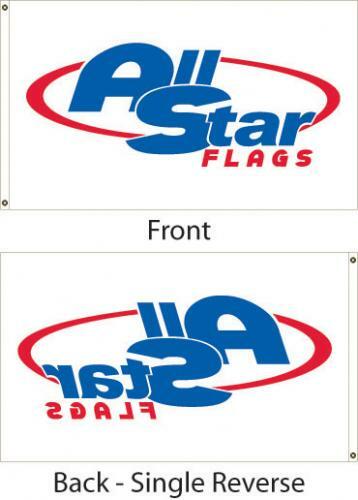 All Star Flags custom flags are digitally printed with your design or logo. This custom-made flag is printed on nylon and comes standard with either header & grommets or pole sleeve. The custom image on the 5x8' flag is printed "single reverse", so it is correct on the front and bleeds through to the back but the image is mirrored. **Vectored artwork is required (.ai or .eps with all text converted to outlines). Don't have vector art? Contact a service representative at All Star Flags and they will provide you with an artwork quote for your outdoor advertising banner.